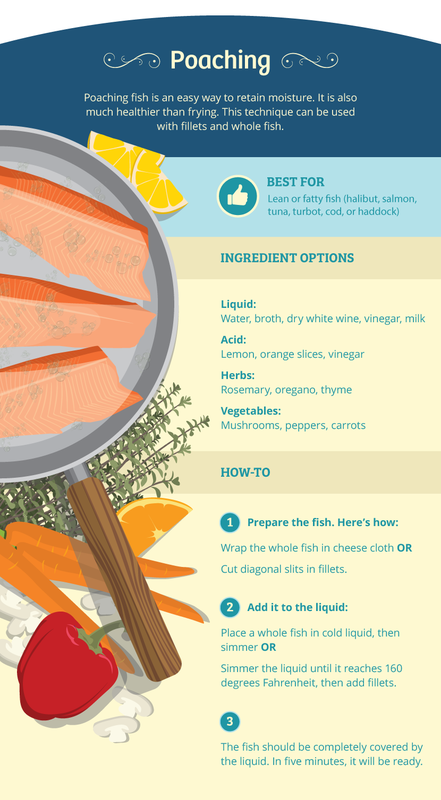 These four methods are top-notch, since additional aromatics are cooked close to the seafood. They are also healthier than baking or frying, because no extra fat is needed. Cooking seafood can be intimidating. After all, it usually seems fancier than ground beef or chicken breasts. And when it comes to adding flavor, things can get pretty confusing. How do you get the most flavor? Fortunately, you do not need to be a chef in order to make it happen. It can be extremely easy, if you know what to look out for. That is where this list of tips and tricks comes in. When it comes to poaching, most people think about eggs. But did you know that fish can be poached, too? This technique gently cooks fish by submerging it in hot liquid. It is a great way to retain moisture. And since poaching does not use oil, it is healthier than frying. To poach fish, you will need four things: liquid, acid, herbs, and vegetables. The last one is optional, but ideal for boosting flavor. Traditionally, poached fish is cooked in court-boullion, a clear broth that is made separately. But you do not have to get fancy. The liquid can be as simple as water, broth, dry white wine, vinegar, or milk. Possible acids include lemon, oranges, and vinegar. Herbs and vegetables can be chosen depending on a theme or can be whatever you have on hand. All of these components can be mixed and matched to create custom combinations. Both fillets and whole fish, fresh or frozen, can be poached. 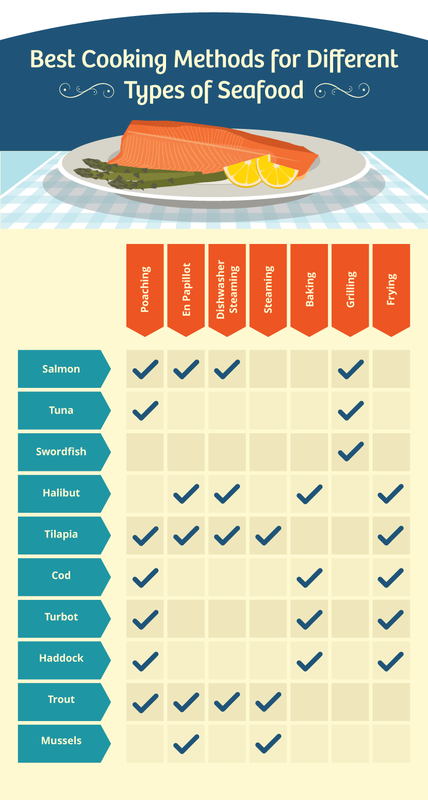 Use fatty or lean fish, like halibut, salmon, tuna, turbot, cod, or haddock. If you are feeling adventurous, poach the liquid into a sauce. Talk about resourceful. En papillote might sound glamorous, but it is surprisingly easy. This method is a type of moist-heat cooking that can be used with fish or shellfish. It involves a simple packaging that lets the seafood cook in its own juices. And since there is no added fat, it is super-healthy. En papillote is the ultimate way to enjoy fish in its purest form. Parchment paper is recommended for en papillote. The smooth side is stick-resistant, making for easy clean-up and eating. 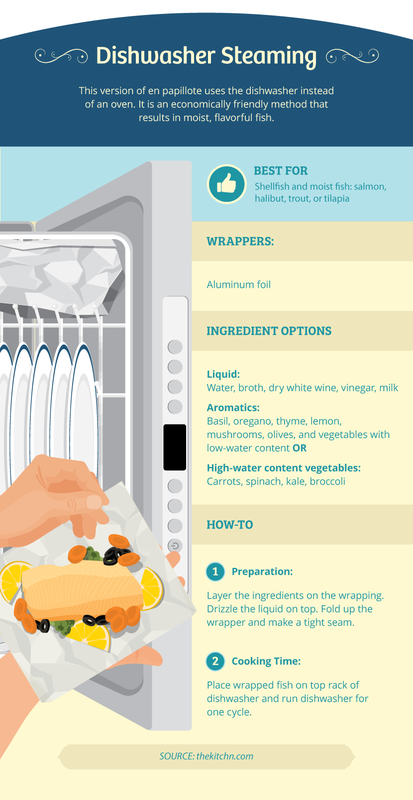 Aluminum foil can also be used, but only if you are not using salt or acids. It is great for making a super tight seal, though. Even soaked banana leaves, bamboo leaves, grape leaves, or corn husks can be used. Liquid is a must for en papillote. This creates the steam needed to cook the fish, while infusing it with flavor. Aromatic ingredients can also take things up a notch. Yummy ideas include orange slices, lemon, mushrooms, and olives. Alternatively, you can just skip the liquid and use vegetables that have high water content. Broccoli, spinach, and carrots are all great options. Whatever you use, make sure everything is done at the same time. You can always pre-cook ingredients beforehand to ensure this. Thin fillet cuts that are no thicker than an inch work best. En papillote is perfect for moist fish like salmon, halibut, trout, and tilapia. Shellfish can be cooked this way, too. Yes, you read that right. It might sound ridiculous, but the idea has merit. It is similar to en papilllote, but involves using the dishwasher instead. Of course, this works best when you are using the dishwasher anyway. And while it might seem like a Pinterest fad, this technique has been used for many years. Think about it: the hot water in the dishwasher will cook the fish and ingredients. And as long everything is wrapped up properly, your fish will not be soapy. This technique is also extremely economically friendly and resourceful. Steaming is the easiest, most popular way to cook mussels. For best results, use a pot—not a steamer. This will let the mussels come into direct contact with both the steam and extra ingredients. So try to use a wide pot, if possible. The more room, the better. Like en papillote, a liquid is imperative. You can stick with simple H2O or use white wine, beer, or broth. For even more flavor, cook herbs and vegetables in oil or butter in the pot beforehand. Onion and garlic are fool-proof choices. Hopefully, you are feeling inspired (and hungry) enough to try one of these methods. Do not be afraid to experiment with different liquids and aromatics. You just might impress yourself.